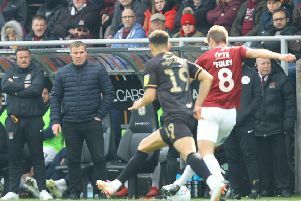 David Flitcroft said his Mansfield Town side will take the point gained from the 1-1 draw at Northampton Town but that they weren't necessarily pleased with it. A scrappy game saw Stags open the scoring through Mal Benning's goal direct from a corner, before Sam Foley levelled in the second-half. And Flitcroft reflected that at times his side weren't composed enough on the ball at times in the game. He said: "It was a well-earned and hard-earned point but it's disappointing not to have won when we'd been 1-0 up. "We had to defend about 25 corners and did that really well, but the one where we didn't was the one they scored from. "When you come here you have to be able to defend the direct approach and overall we did that, but that one lapse cost us the three points. "There weren't all that many chances and we didn't commit or do enough to win it, so we have to make sure we are tidier in our work as today we weren't as pristine or calm as we normally are. There was an edginess to our performance." 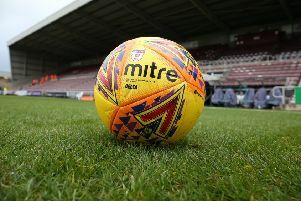 Flitcroft says his job now is to settle the players down for a crucial Easter weekend that will see Stags host Morecambe and then travel to Oldham Athletic. He said: "We will work on things in training as we need to get the lads feeling good about themselves. We were too frantic in the first-half and too rushed, and needed to show more composure but we can sort that. "These boys are really trying. Sometimes they try too hard. Today we had to show a different side to our game, with resilience, togetherness and spirit. "The fans were unbelievable again and here in great numbers but our goal didn't settle us which was a bit of a worry. We were up against a side in mid-table but with lads fighting for contracts and first team places and their livelihoods. So it was never going to be easy."